See also: Confederate Monuments; Union Square. The State Capitol, located on Union Square in central Raleigh, has been the seat of North Carolina government since its completion in 1840. Raleigh had been chosen as the permanent capital city in 1792. After the statehouse on the site burned in 1831-and after the General Assembly had voted not to move the capital to Fayetteville-the legislature in 1833 appropriated funds to build a new capitol building where the old one had stood, incorporating a similar cross-shaped design with a central domed rotunda. The neoclassical design of the North Carolina State Capitol reflects the contributions of several different architects, including Ithiel Town, Alexander Jackson Davis, William Nichols Jr., and William Strickland. Scottish-born David Paton ultimately supervised the majority of the construction and was responsible for many of the building's features. The resulting structure is considered one of the best-preserved examples of Greek Revival architecture in America. The capitol's interior reflects the features of ancient Greek temples, while its Doric-style exterior columns were modeled after the columns of the Parthenon. The chambers for the State Senate and House of Representatives are designed in similarly classical fashion. The final cost of the State Capitol building was more than $532,000, a massive sum for the era. The completion of the building-and the simultaneous completion of the Raleigh & Gaston Railroad-was celebrated in Raleigh in June 1840 with dinners, dances, parades, and train rides enjoyed by crowds from throughout the state and beyond. 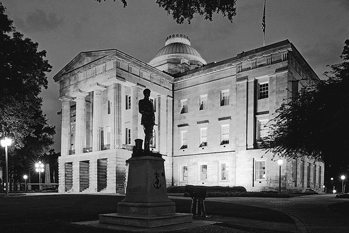 The entire North Carolina state government was situated within the building's walls until 1888, when the Supreme Court and the State Library relocated. In 1963 members of the General Assembly moved their offices to the State Legislative Building a block away. The modern-day capitol building houses the offices of the governor and lieutenant governor and their staffs. A replica of an Antonio Canova statue of George Washington (the original of which was destroyed in the 1831 fire) stands in the center of the State Capitol rotunda, and many plaques and busts line the walls. On the grounds are a variety of monuments and statues, including those honoring North Carolina's three presidents (Andrew Jackson, James K. Polk, and Andrew Johnson), the women of the Confederacy, and veterans of the Civil War and the Vietnam War. The State Capitol building is a North Carolina State Historic Site. Cecil D. Eliot, "The North Carolina State Capitol," Southern Architect 5 (June 1958). The North Carolina State Capitol. Photograph courtesy of North Carolina Division of Tourism, Film, and Sports Development.